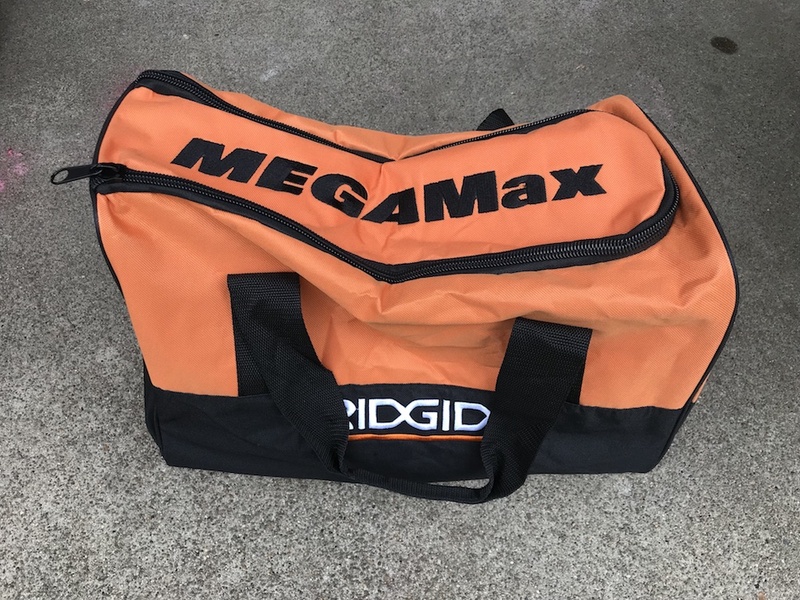 From the time I started taking the Ridgid MegaMax components out of their boxes, it was clear these were made for heavy-duty use. The Power Base, which serves as the main handle, and houses the motor and drive gears, weighs in at just under 4 lbs. without a battery. 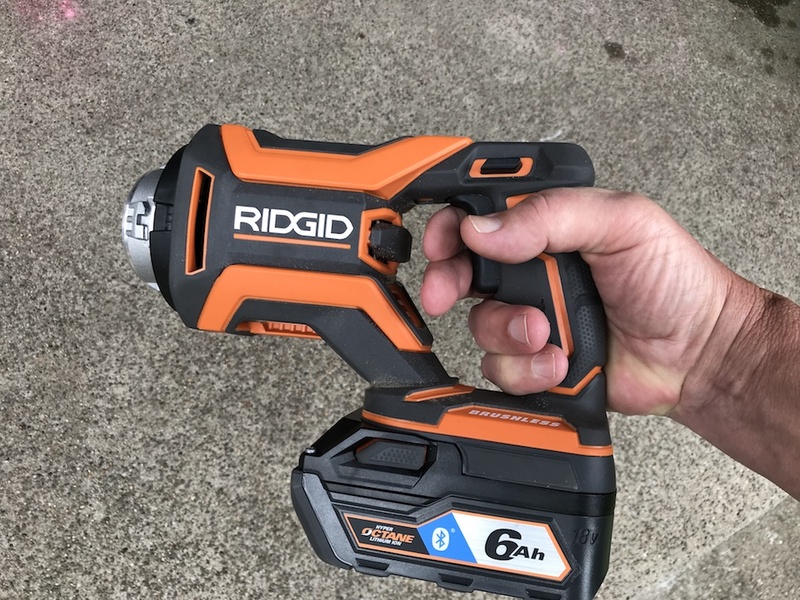 Installing the powerful Ridgid Hyper Octane 6.0 Ah battery kicks it up to 5 lbs. 12 oz. 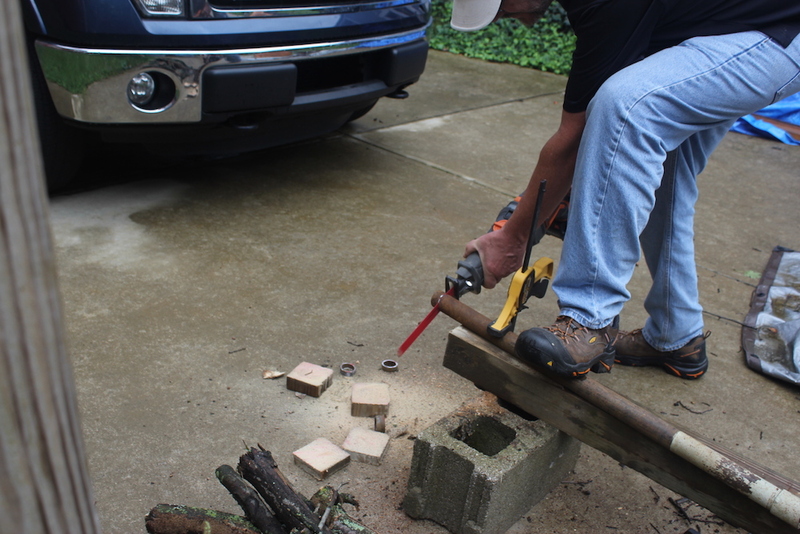 The weight is a byproduct of the beefy construction on the Ridgid MegaMax Power Base. The powerplant is a robust brushless motor. For the uninitiated, brushless motors are the wave of the future. They’re much more powerful and efficient than their brushed counterparts, don’t require maintenance in the form of brush replacement, and are more durable than brushed motors. Also packed inside the case on the Ridgid MegaMax Power Base are some sophisticated electronics. 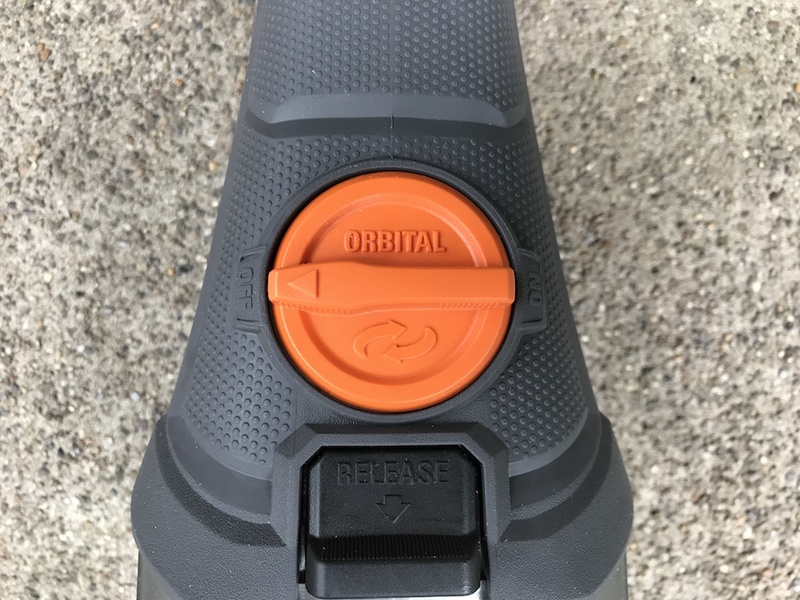 The base automatically senses which accessory is connected, and reconfigures the tool settings to match the head profile. The electronics can also detect when the tool is overloaded; when that happens, it shuts ‘er down and issues three scolding beeps (Just take it easy, will ya?!). When you release the trigger, it will reset and get back to work. If the tool or battery get overheated, the electronics will shut the tool down until it’s cooled off a bit. And with our three components inside, there’s still room for the SDS-Plus rotary hammer. The base-to-head interface on the Ridgid MegaMax Power Base is die cast and tool free. All of the attachments simply rotate and lock into position on the base. But there’s a bigger twist: All of the auxiliary heads can be attached in any position at 90-degree intervals. This gives you an amazing amount of flexibility when it comes to working in various situations, many of which involve contorting your body into unnatural and uncomfortable positions. And all attachments can be rotated in 90-degree increments. The case is made of very rugged plastic, and the handle and grip areas are covered with a comfortable, non-slip rubber overmold. The large two-finger variable trigger is comfortable and easy to control. 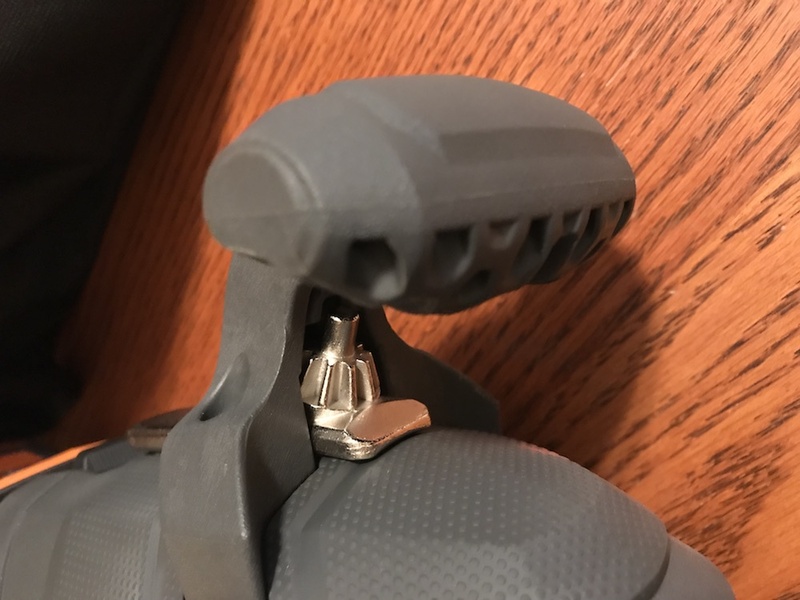 A smaller switch below the trigger activates the LED light on whatever attachment you’re using; a normal grip on the handle activates it. An LED panel on top of the base shows the status of the tool. 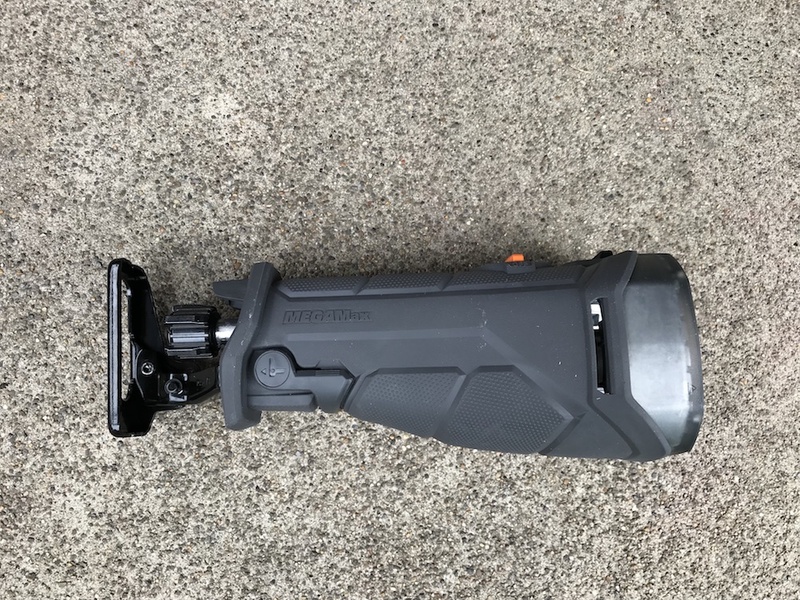 The handle and trigger are comfortable and easy to use. •	LED communication panel shows the status of the tool. •	Backed by the industry’s only lifetime service agreement. Just like in politics, having a power base does you no good if you have no minions to do your bidding. The first MegaMinion we’ll be looking at is the Ridgid MegaMax right angle drill head. 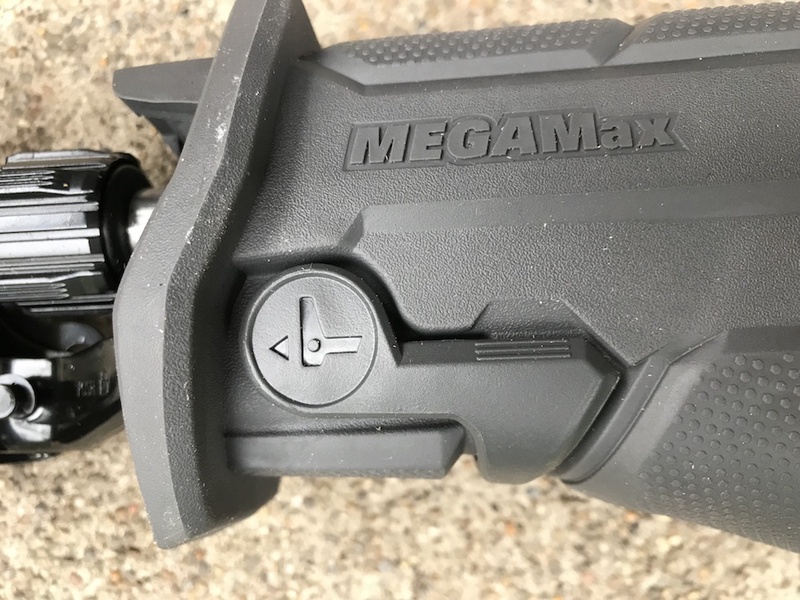 The Ridgid MegaMax right angle drill head is NOT a dainty little tool; it looks and feels very beefy, and weighs in at almost 6 lbs., making the total weight around 11 lbs. 11 oz. with the Power Base and battery. 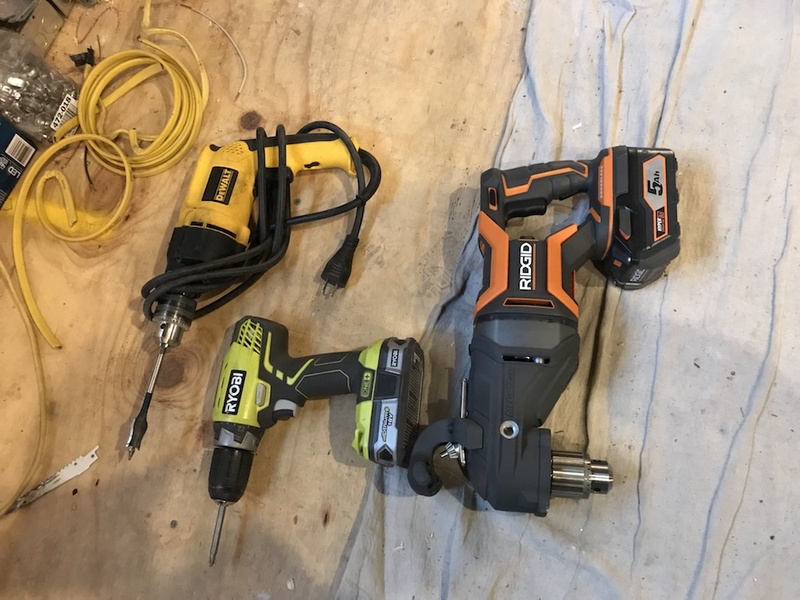 While this is not exactly svelte, by comparison the Milwaukee Super Hawg weighs in at 14 lbs., and the DeWalt FlexVolt Stud & Joist drill just under 13 lbs. Some friends who live in our neighborhood are redoing the kitchen in their 100-plus year old house, and are doing a lot of the work themselves. My friend is at the portion of the festivities that involves running all new wiring. He started out using a basic Ryobi drill driver. That did OK in soft, new studs, but just said Hell NO when it came to the 100-year-old hard, dry, 2” thick joists. 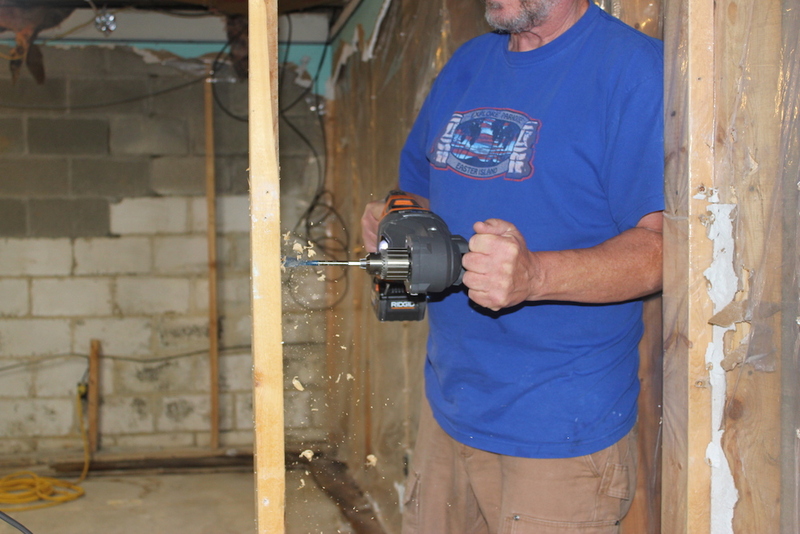 He had switched to a corded DeWalt ½” drill. 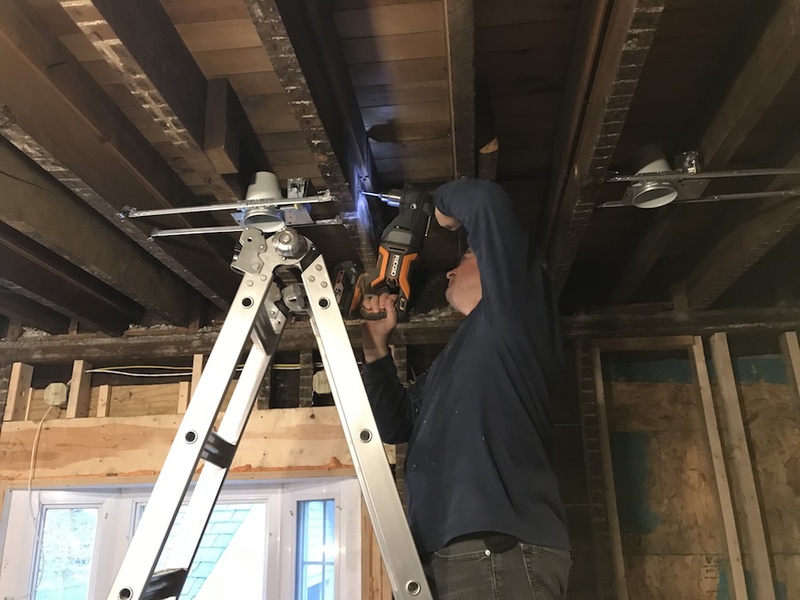 It was working fine, but trailing the cord up and down the ladder to drill each ceiling joist 10’ up was losing its appeal. 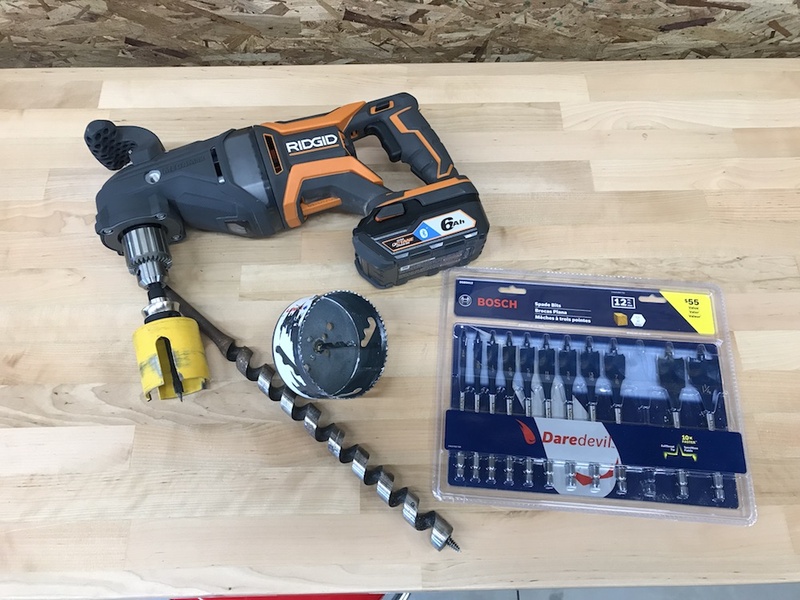 I brought over the Ridgid MegaMax power base and right angle drill head, and an assortment of Bosch Daredevil spade bits to use. As it happened, that’s what he was already using. And they were working fine – most of the time, anyhow, as we shall see. 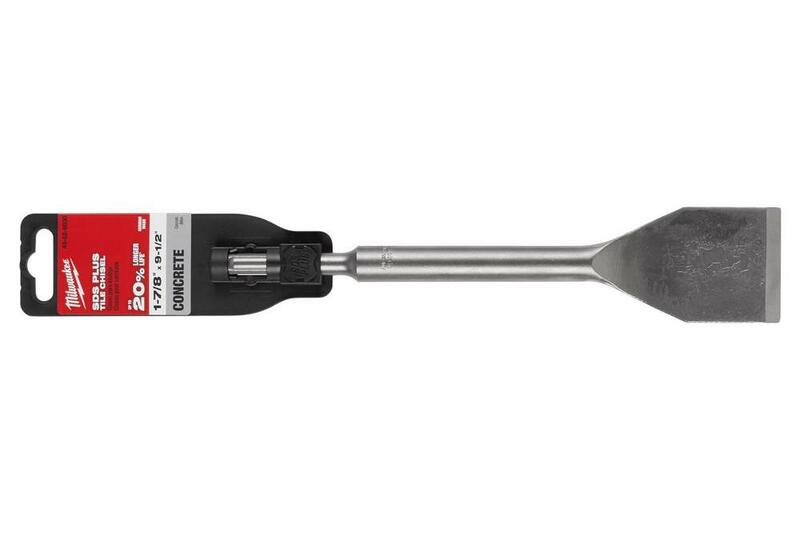 Snugging up the Bosch 1″ spade bit. He chucked up the 1” bit, climbed the ladder, and assumed the position. 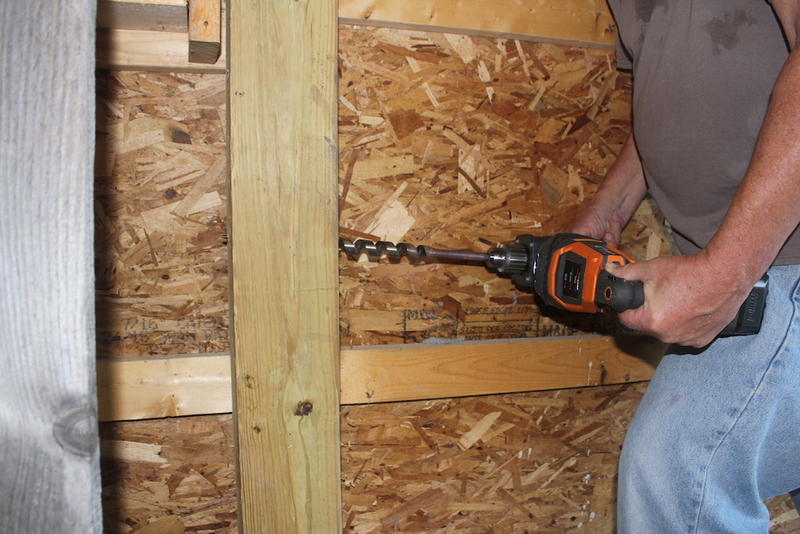 The Ridgid MegaMax drill powered easily through the hard, old studs. I watched for a few minutes, then headed for home. A few days later, I picked up the drill, and got his feedback. 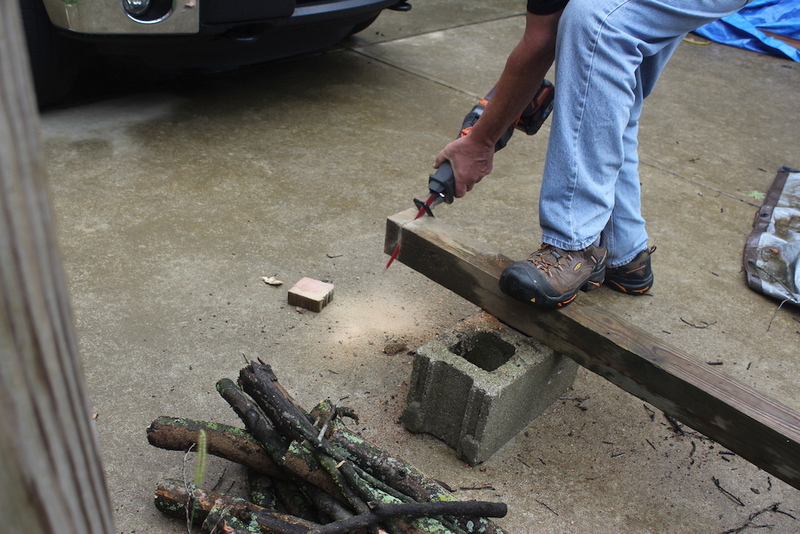 He said the drill works great, with plenty of torque to easily get through all the old wood he was dealing with. Enough torque to snap the new spade bit when it hit a massive old cut nail in one of the joists, and spin his wrist around a bit. The only negative comment was that it’s heavy, especially for overhead work like he was doing. He also mentioned that there is a small amount of play where the head joins the power base. I had noticed this, too, but the connection seems very solid, and it doesn’t affect performance at all. Making the 100-year-old chips fly. The LED light helped in the dark joist bays. The Ridgid MegaMax right angle drill head is clearly overkill for small projects, so I wanted to give it a more challenging workout. I chucked up a 2-1/2” hole saw, and made a couple of holes in a piece of 2X material. It breezed through them so easily I swapped it out for a 4-1/8” hole saw. Once again, the drill powered through easily, with no struggling or stalling. For its next mission, I used my 1” ship auger bit. I’m still in the process of wiring my new shop, and much of the wiring has to pass through 6X6” posts. 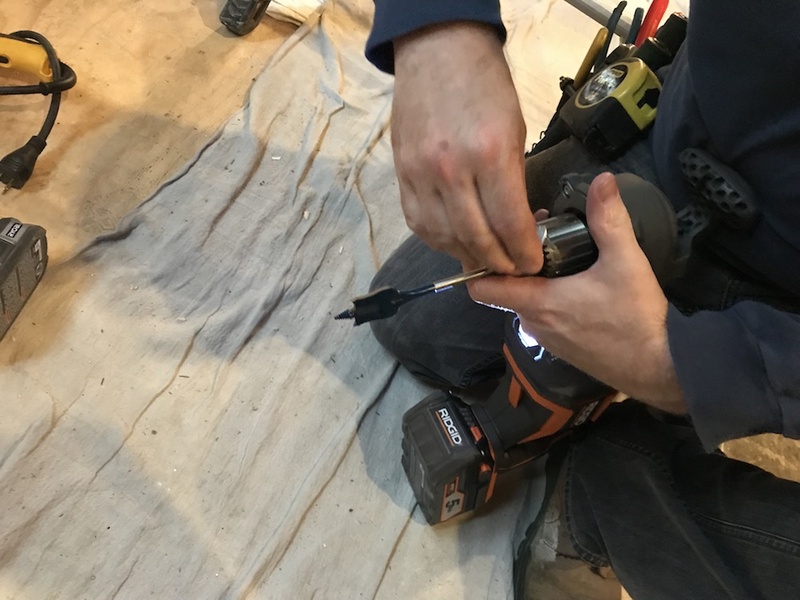 The ship auger bit is ideal for this kind of work, and the Ridgid MegaMax right angle drill head easily spun it through. This is the type of work the Ridgid MegaMax right angle drill head is ideally suited for. It has plenty of power to make big holes in framing members and floors to run plumbing, electrical and HVAC. Having the ability to lock the head on at any of four 90-degree angles makes it easy to find a position that gives the best comfort and leverage. My chuck key needed minor modification to stay in its hidey-hole. The only problem I had while using the Ridgid MegaMax with the right angle drill head attached was with the chuck key. It’s very sturdy and it works fine, but it fell out of its storage slot several times while I was using the drill. 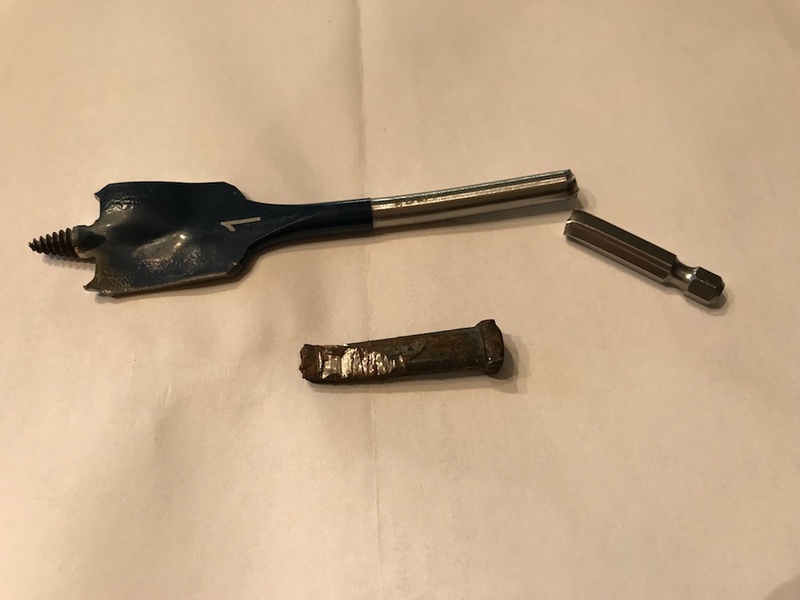 Unless you don’t ever plan to change drill bits, losing the key would likely put a damper on your day. I put a little piece of duct tape on one side of it, and that seemed to give it just the right amount of friction to hold it in place. You could also use a sturdy rubber band or pony tail band to hold it in. 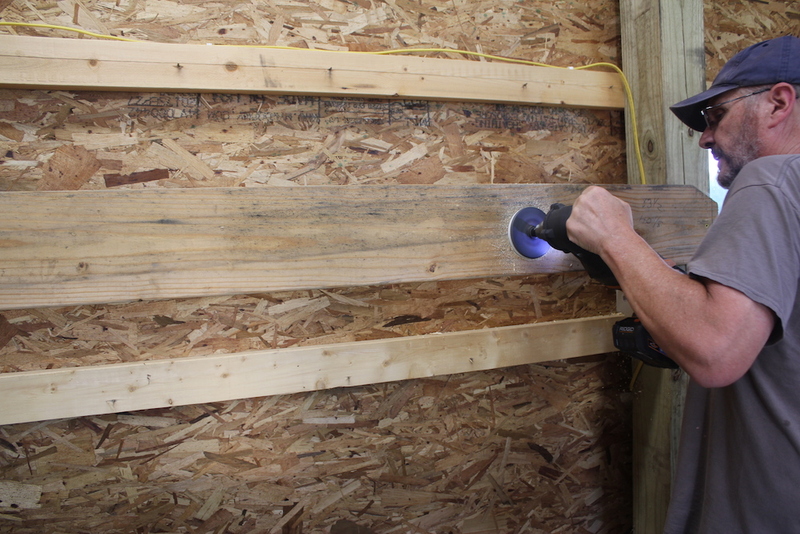 Next up is a tool that’s a staple in the tool kit of every renovator and remodeler, and anyone else who does demo work. Not to mention most plumbers and electricians, and a good percentage of DIYers. 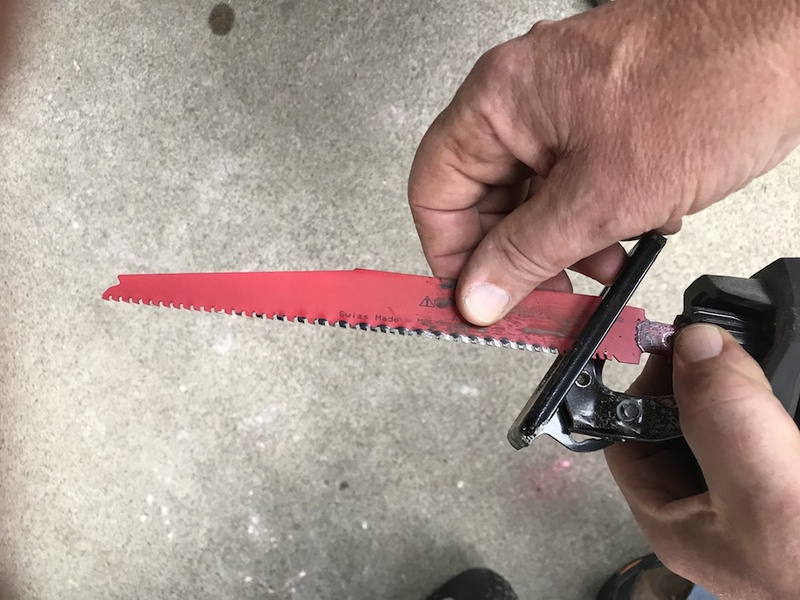 A good reciprocating saw is worth its weight in decapitated studs, pipes, roofing…you name it, and with the right blade, a good recip saw will demolish it. The Ridgid MegaMax reciprocating saw head has most of the features found on high-end standalone reciprocating saws. A large orange dial lets you easily switch between regular and orbital action, handy for faster cuts in wood and softer materials. 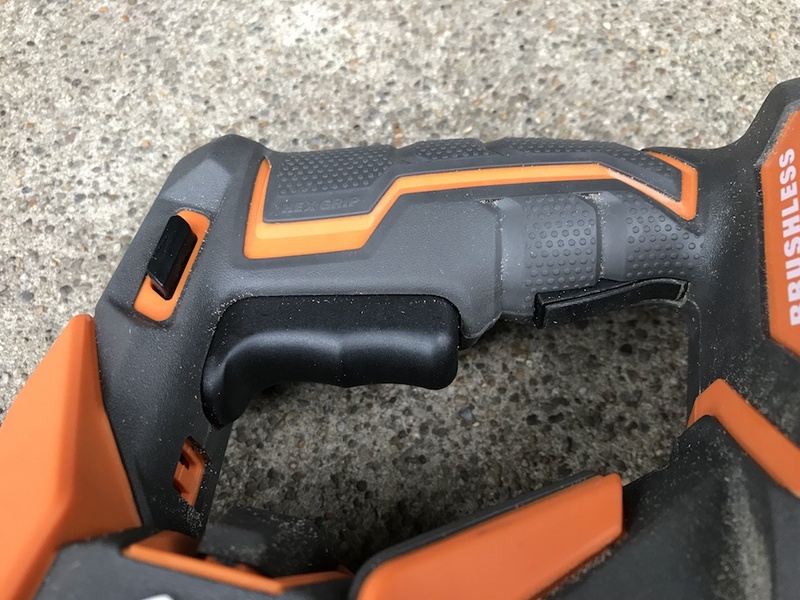 A tool-free adjustable shoe lets you control the depth of cut when plunging into walls, or move up to a fresh chunk of blade when the teeth near the base start looking a bit raggedy. And a quick lever flip lets you adjust the front shoe. Blade changes are also tool-free, and very fast and easy. Simply twist the spring-loaded knob, drop the blade in, and release the knob. Since blades can be inserted in either orientation, and the head can be installed in any of four positions, you’ve got a LOT of flexibility in how you use the Ridgid MegaMax reciprocating saw head. The entire reciprocating saw head is covered with a rubber overmold, which helps reduce vibration and improve grip. Just twist the collar and slide blades in or out. All bladed up and ready to slice. •	Weighs just under five lbs. The Ridgid MegaMax reciprocating saw head comes with a Ridgid 6” wood-cutting blade, to get you started. 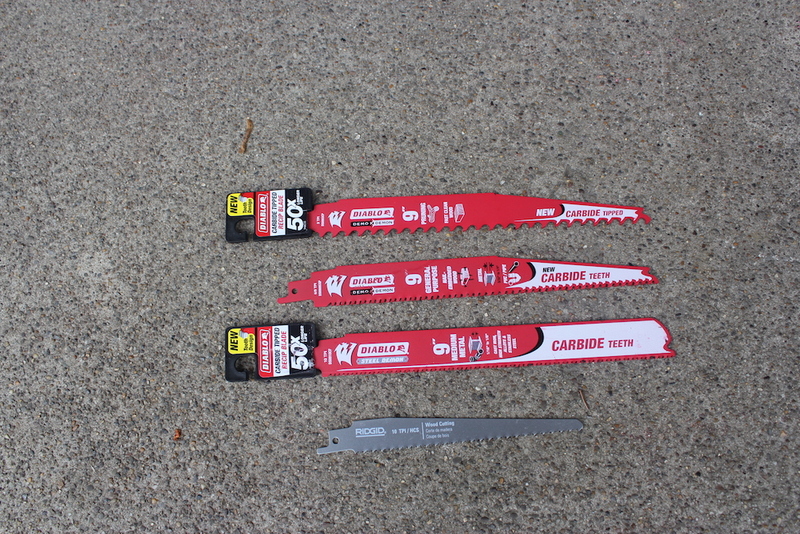 When our package arrived, three Diablo blades had hitched a ride, so we used them when we tried out the saw. First up was the Diablo Demo Demon 9” pruning blade. 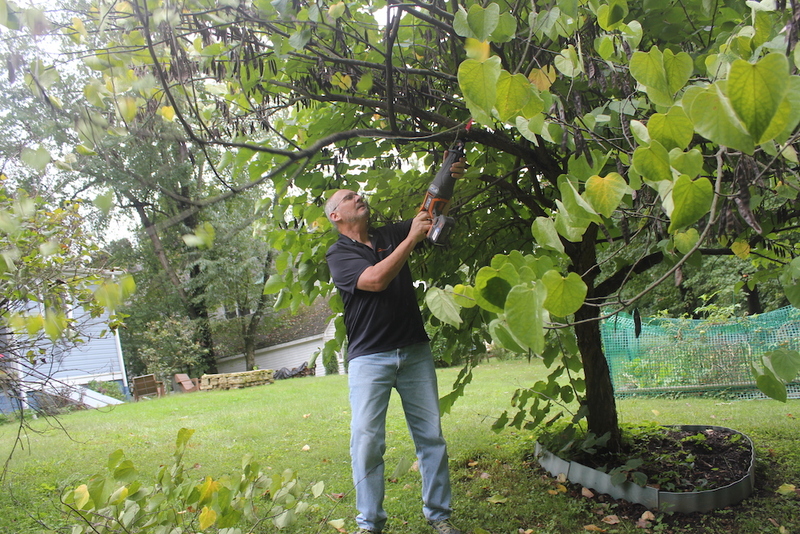 I inserted the blade, and headed out to remove a few unruly branches from a tree in our back yard. 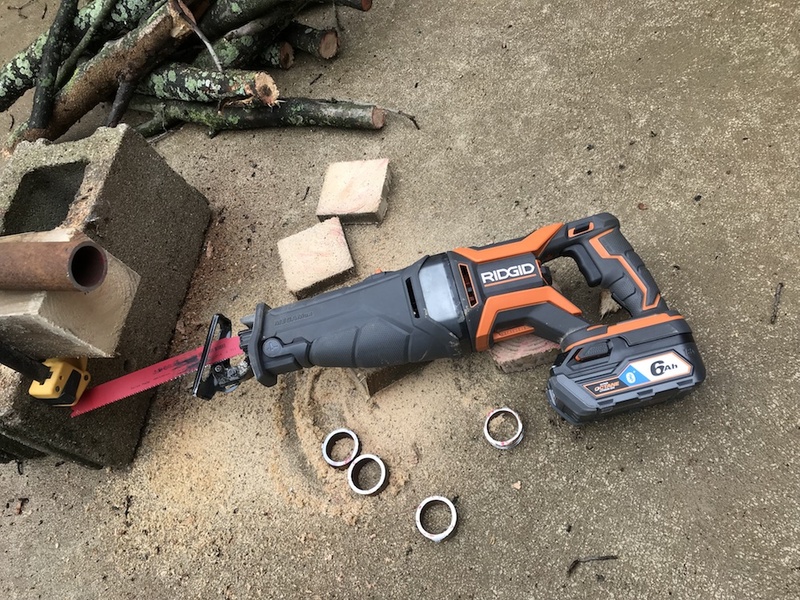 With the aggressive teeth on the Diablo blade, the Ridgid MegaMax recip saw made short work of it. 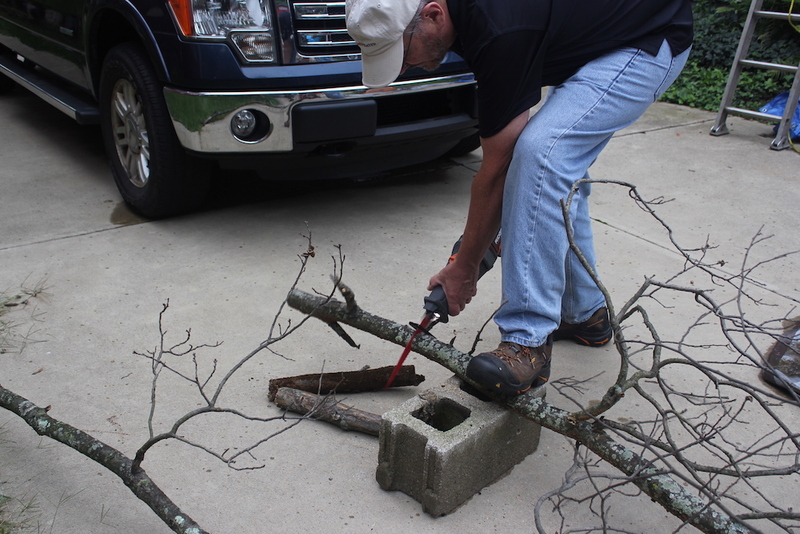 Next it was up to the driveway, where a couple of oak limbs that had come down in a recent storm were patiently waiting to be sliced and diced. Even with a short rain break, I quickly had the branches right-sized. To up the ante a bit, I swapped out the pruning blade for the Diablo Demo Demon general purpose 9” blade. I grabbed a wet pressure-treated 4X4” post, turned the orbital action on, and got to work. 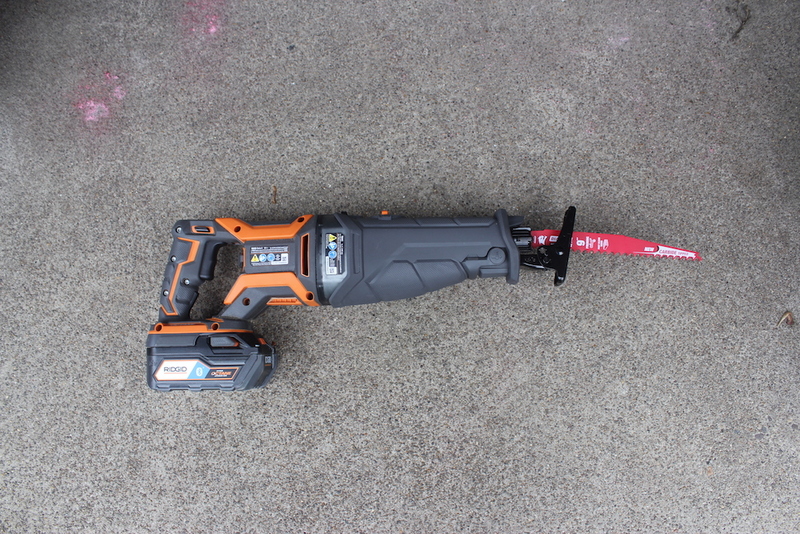 The Ridgid MegaMax reciprocating saw chugged steadily through several cuts, with no binding, stalling or bogging down. Reciprocating saws routinely get called on to rip through pipes, including PVC, copper and steel. 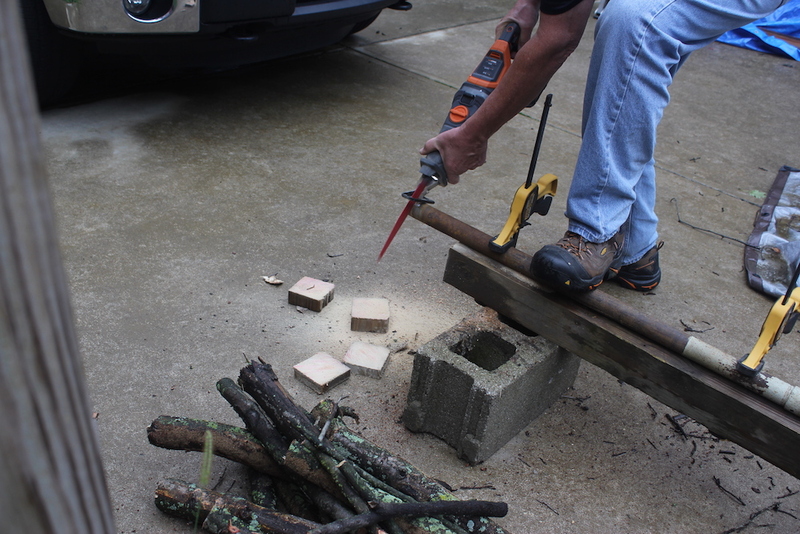 Naturally, we had to see how the Ridgid MegaMax reciprocating saw would do. The general purpose blade I had used on the 4X4 claims to be able to cut embedded nails, and steel up to ¼” thick. Sounds like a challenge! So before changing out the blade for the metal-cutting blade, I turned off the orbital feature, and introduced it to a heavy piece of 1-1/2” diameter steel pipe, cutting off a couple of chunks. It tore right through it, actually seeming to cut faster in steel than wood! Yipes, pipes -The Diablo Demo Demon general purpose blade tore through the steel pipe. The Ridgid MegaMax SDS Rotary Hammer head, ready to meet and beat the ‘crete. The Ridgid MegaMax SDS Rotary Hammer head can operate in any of three modes: Rotary drilling (like a standard drill), hammer mode, and chisel mode. Switching modes is simple – just twist the dial. 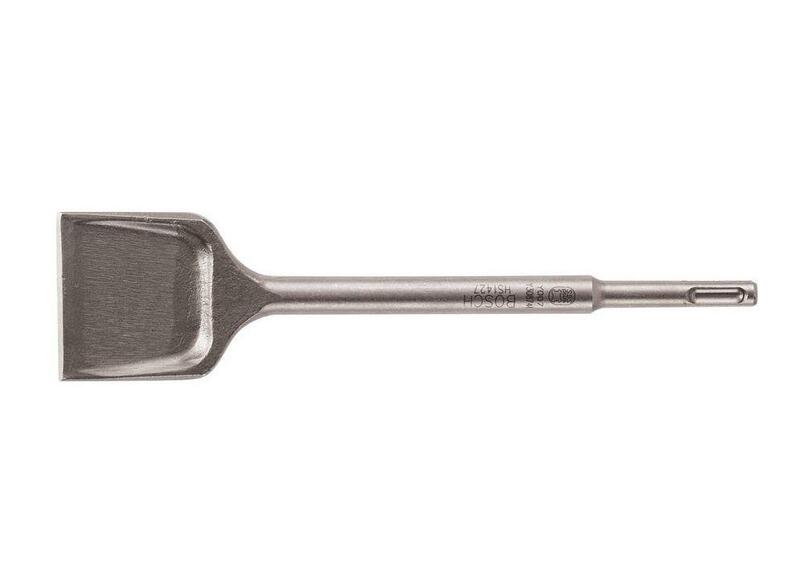 The head will accept any SDS-Plus attachment, which have slots near the base of the shank and just push into the chuck. 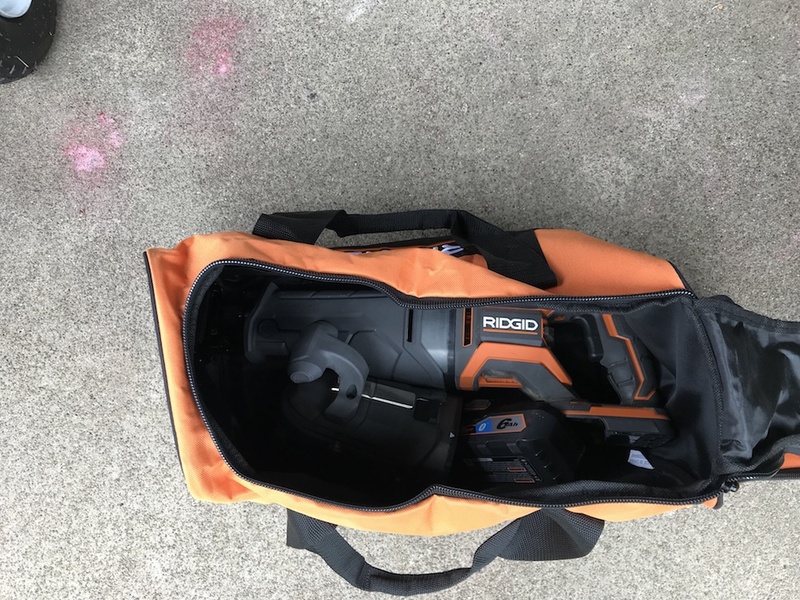 Naturally, there are masonry bits for drilling holes, but the Ridgid MegaMax SDS Rotary Hammer head is capable of lots of other feats of construction – and destruction. When used to drill into concrete, the Ridgid MegaMax SDS Rotary Hammer head uses both rotary and hammer modes. Using the selector switch to turn off rotary mode allows you to use “chisel” type bits, which use only the hammer mode. There are bits available for breaking up concrete, scraping up flooring, and breaking up and removing tile, among other things. 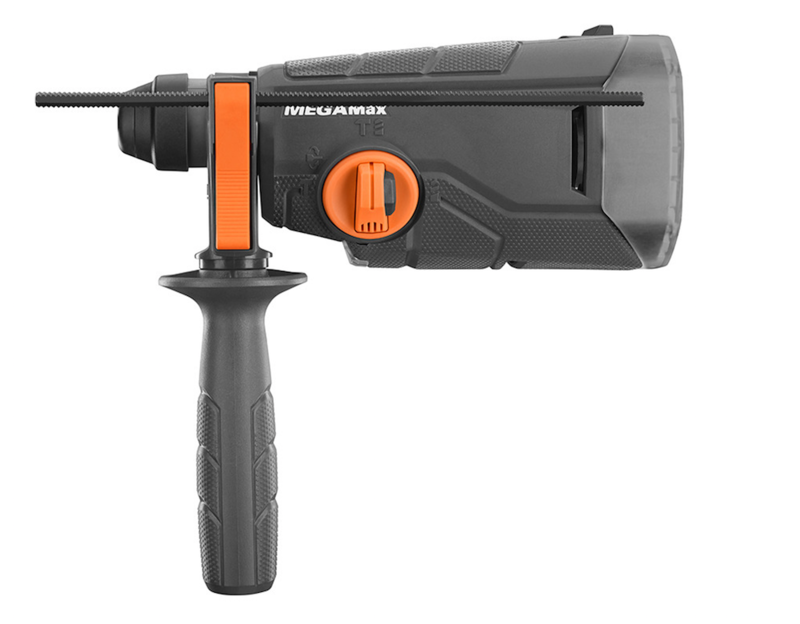 Ridgid says the MegaMax rotary hammer is the only SDS in the industry capable of locking on in hammer mode. And other specialty bits, like tile chisels. 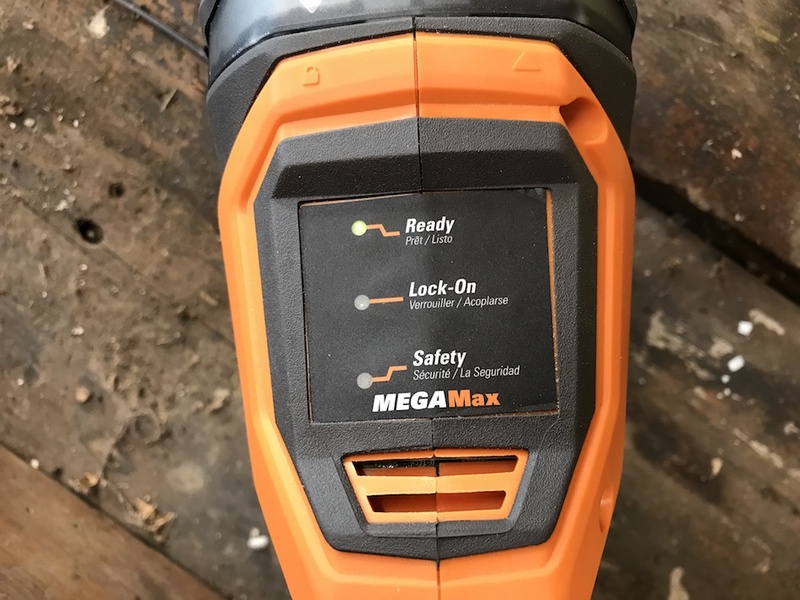 Along with the Ridgid MegaMax system, Ridgid recently introduce its 18V Hyper Octane Bluetooth-enabled 6.0 Ah battery. 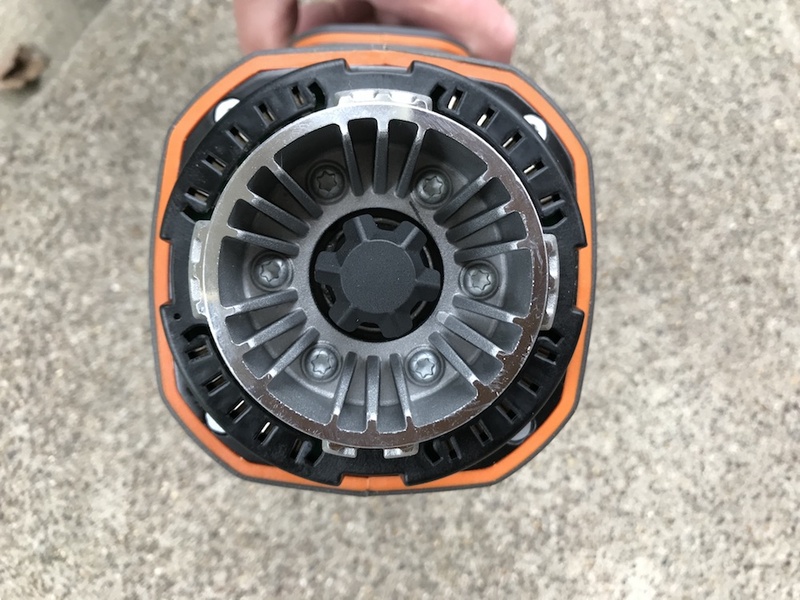 Using engineering magic, Ridgid managed to fit its 6.0 Ah battery into a footprint the same size as their 5.0 Ah battery. 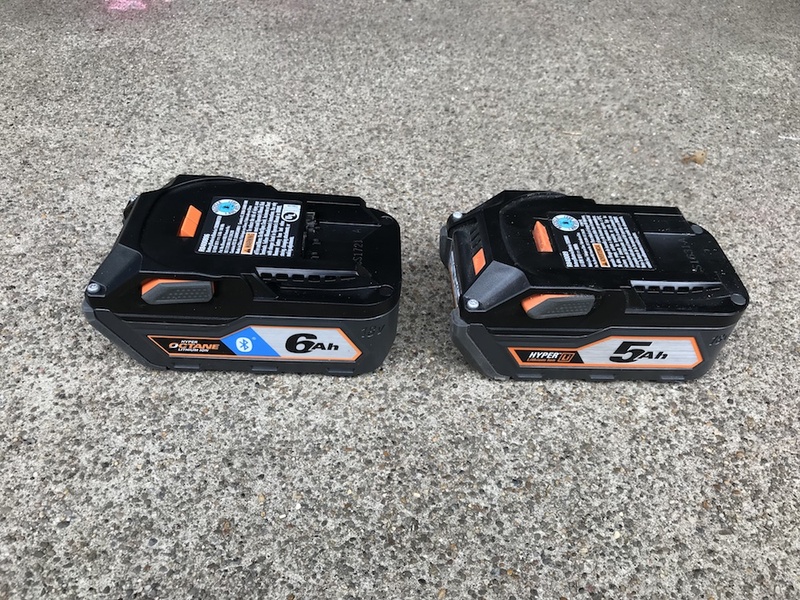 The 6.0 Ah Ridgid Hyper Octane battery is the same size as the 5.0 battery. 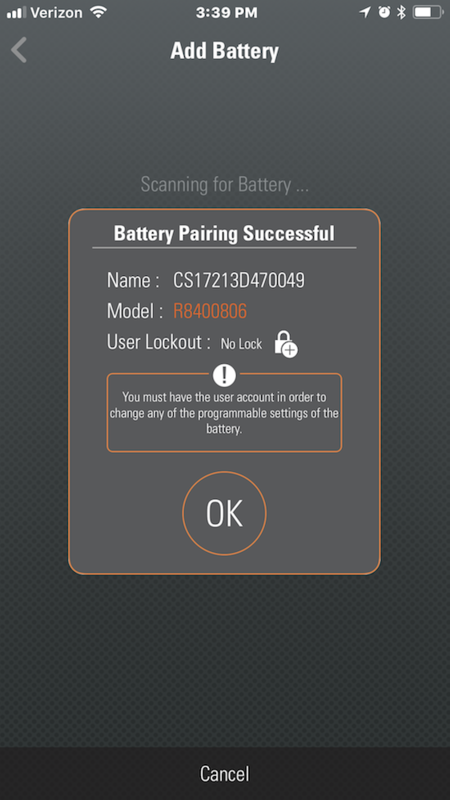 A free mobile app is available for the Ridgid Hyper Octane battery. 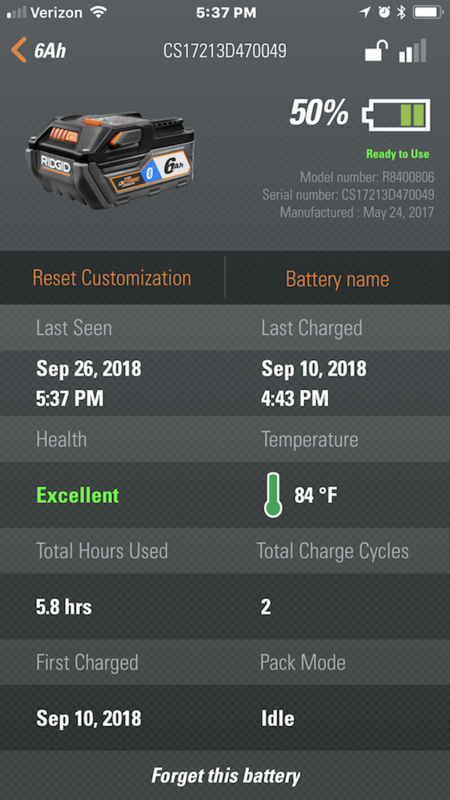 After installing it on your phone and synching it with the battery, you can use the app to get a variety of info on the battery, including temperature, percentage of charge remaining, total hours used, number of charge cycles, and more. If you have an 18V Ridgid charger, it will work fine to charge the Hyper Octane battery. If not, one option to keep it topped off is the Ridgid Dual Port sequential charger. 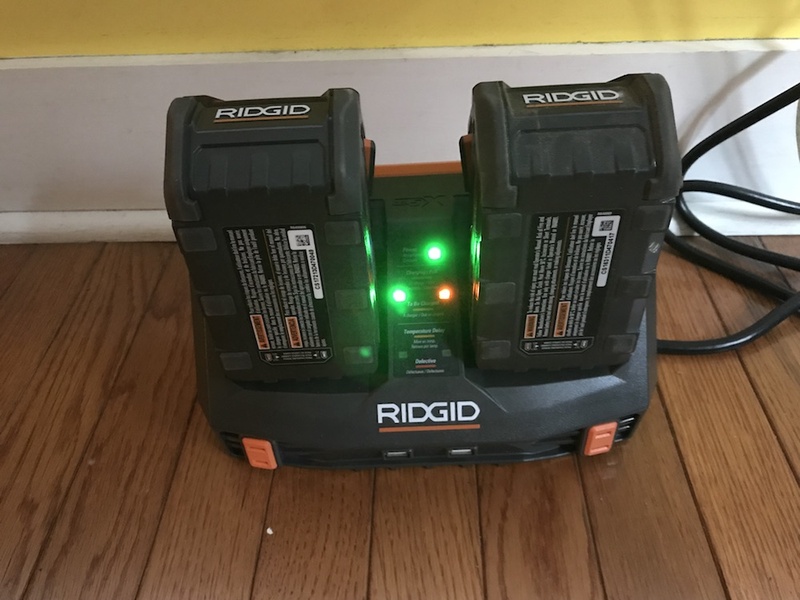 It will charge any Ridgid battery in less than an hour, and has two USB charging ports, to keep your MP3 player or cell phone topped off. It can be wall mounted, and has electronics to evaluate the batteries and show their status. Ready To Take It To The MegaMax? When I heard there was a multi-function tool coming to evaluate, I was prepared to be underwhelmed. Seems like much of the time, products that are designed to do several things don’t do any of them particularly well. The Ridgid MegaMax system is an exception. The Ridgid MegaMax system is rugged and performed very well. The Ridgid MegaMax system is well designed, built from quality materials, and works very well. Ridgid backs the tools with a three-year limited warranty, and if you register the tools within 90 days of purchase, they’re covered by Ridgid’s Lifetime Service Agreement. The Home Depot’s return policy gives you a chance to be a demolition man or woman for 90 days risk-free. At the time of this review, every customer review online has given five stars to the Power Base and all three attachments. The word that crops up most frequently in these reviews is “Beast.” I concur. 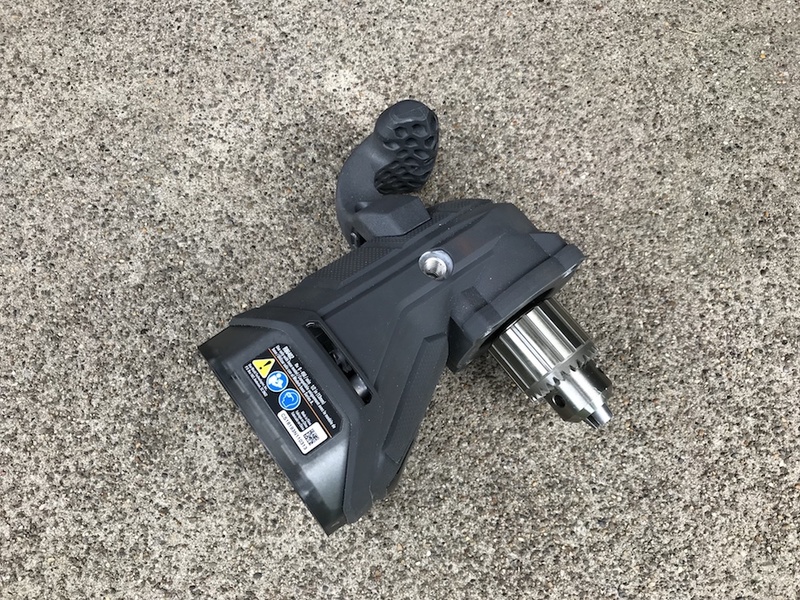 If you’re looking for a new reciprocating saw, right angle drill, or rotary hammer for yourself or your crew, head over to the Home Depot and see if it clicks for you, or you can purchase through the links below. Awesome stuff! And I’m really impressed by the things the new batteries can do. When I first heard about them, I was skeptical (really… wifi-enabled tool batteries?). But when I learned about the “find-my-battery” ability, I realized it just might be a game changer.